Edwin Fischer was, on the concert platform, a short, leonine, resilient figure, whose every fibre seemed to vibrate with elemental musical power. Wildness and gentleness were never far from each other in his piano-playing, and demonic outbursts would magically give way to inner peace. It was as little trouble to him (as Alfred Polgar once said of an actor) to lose himself as to find himself. His playing of slow movements was full of an unselfconsciousness beside which the music-making of others, famous names included, seemd academic or insincere. With Fischer, one was in more immediate contact with the music: there was no curtain before his soul when he communicated with the audience. One other musician, Furtwängler, conveyed to the same degree this sensation of music not being played, but rather happening by itself. His death was a grievous blow to Fischer. There are pianists whose playing is so predictable that if they fell into a faint it would create a welcome diversion. Fischer could spring a surprise at every note; he could also alarm you with his nerves, or make your hair stand on end with his childish fancies (as in his dreadful cadenzas!). There are pianists who hang on the music like parasites, and there are the platform hyenas who devour masterpieces like carrion. Fischer was a giver; he let out his breath and recommended his pupils to practise exhaling every morning. (Inhaling, he said, was easy.) This 'musical exhalation' was made possible by a singularly relaxed technique. Though it also gave rise to some inaccuracies, these in the end mattered little; the gain was overwhelming. 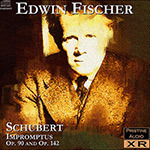 These 1938 recordings of the Schubert Impromptus are rightly held up by Brendel as examples of Fischer at his best. Each Impromptu should sound almost freely improvised - here that feeling is conveyed perfectly, along with a sense of inevitability, suggesting that there is no other way to continue each piece to its perfect conclusion. Rightly starred in the first UK edition of The Record Guide, this is the sound of a true master at work.